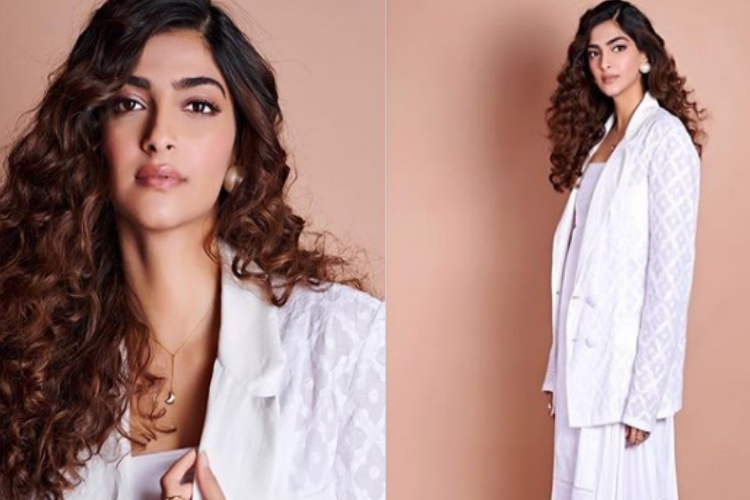 Sonam KApoor Ahuja's permed hair are stealing hearts since a long time now. Ever outfit she wears suits her hair so well that we are wondering why wasn't her hair all wiggly and curly before. Since she is the torch bearer of fashion in our Bollywood industry, every style she chooses becomes trends. Recently she shared one of her all white looks and we adored her completely. She was wearing one of the most flared up picks from Rahul Mishra's summer collection. It was all white with a loose pleated culotte and a white tube. To make the apparel more astounding, a white jacket was added to it and it truly upped the entire game. She teamed up the ensemble with Jimmy Choo boots and once again proved that she is the queen B when it comes to dressing. Wearing minimalism jewelry, Sonam stood tall like a fine painting. Her permed hair added a little ommph too and we were totally smitten by her charm and finesse. Do you like this look on her? Do let us know by commenting below.